First week up and I'm working with Tesco to bring this little bake of mine to celebrate Cake week. The challenge being a drizzle cake, a jaffa cake using a fatless sponge and a genoise mirror cake. 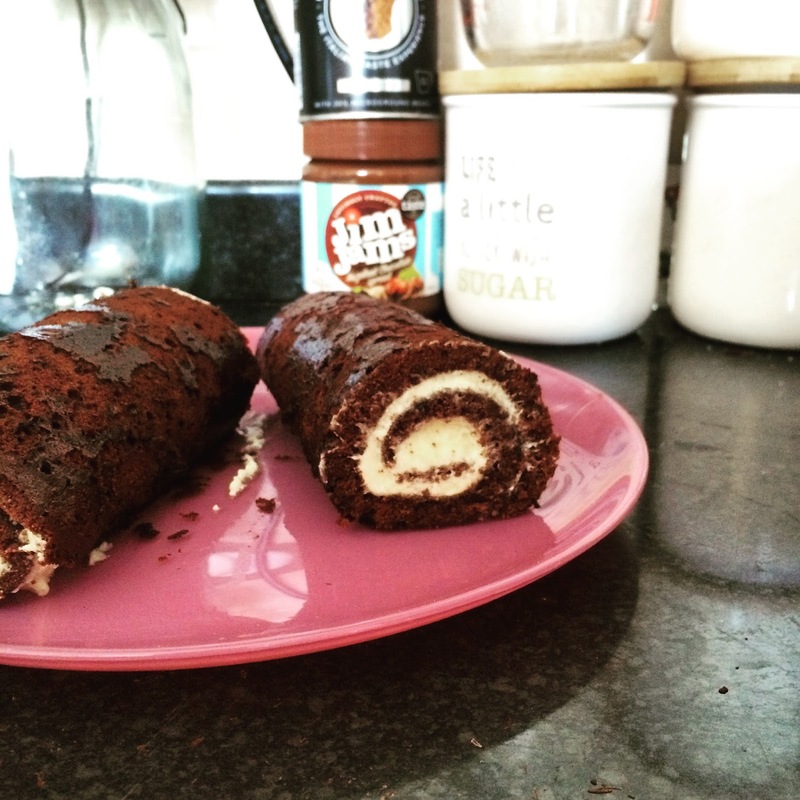 Not wanting to hit the ground running I took inspiration of the fatless sponge and went for a chocolate Swiss roll. 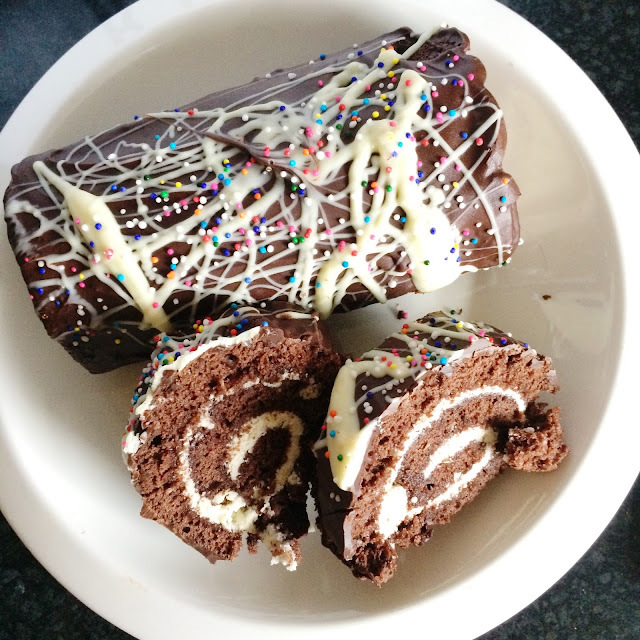 I have made a Swiss roll once before and it was not my greatest success. The combination is simple chocolate sponge, vanilla butter cream and melted chocolate. Whats not to like. The before you add the icing had me a little worried as the outside had stuck a little to the paper I wrapped it in after it cool down. But covering the cake in melted chocolate hid a multitude of sins. The base of a swiss roll sponge is to keep as much air in the batter as possible. I think I lost too air in my mix and it was quite sticky that the spreading out of the tin was a but tricky. Annoyingly also it was so hot in my kitchen the vanilla buttercream was splitting and did not want to cooperate - but a quick chill in the fridge and it was still edible. I used a recipe from Great British Bake: Children's Party Cake and Bakes - which is fantastic for parents. 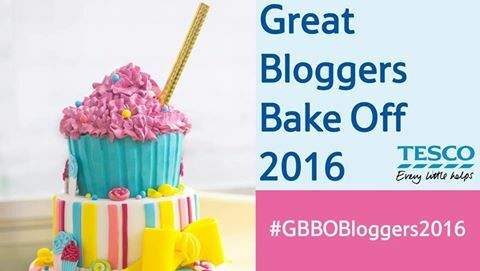 Some great cake ideas, plus like this one ideas for smaller bakes and savoury bakes to complete you party spread. The recipe is a simple one in terms of ingridents - and most things I have stocked in the cupboard. 25g cocoa powder - this Tesco own brand one is great value for money and mixes in well. Preheat the oven at 180c and line the tin. Whisk the sugar,vanilla and eggs together until trebled in size. (I left mine in the mixer on high while I made a cuppa) it should form a thick ribbon when you lift the whisk out. Sift the flour, baking powder and cocoa together and stir into the whisked eggs and sugar. Fold together carefully keeping as much air in the mixture as possible. Pour the melted butter round the edge of the mixture and combine. Pour into the tray and bake for around 7 minutes until cooked through. 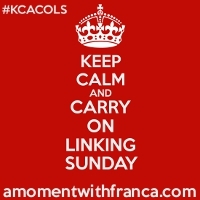 Once out leave it to cool slightly before rolling up - rolling along the long edge. Add a layer of baking parchment on the inside as you roll it up and leave to cool completely. Once cool you can add in the filling. I made a basic buttercream - but whipped cream, flavoured cream, jam, fresh fruit or generous helping of nutella would all work just as well. For the coating I melted down some dark chocolate - I use a mix of higher quality chocolate and the value chocolate. It may not be the best but I find on our budget this is the best way to get the most out of my ingredients. I used the combination of this Ivory Coast 84% Cocoa chocolate and the a bar of the value plain chocolate. I am a chocolate melting heathen and never use softly boiling water and heat proof bowl. I use the microwave slowly option. Smash the bar on the counter (still in it wrapper) empty into the bowl, microwave first for 1 minute. remove and stir. Then after this every 30 seconds. When there is still a few lumps in its done. Leave it to melt the remaining the lumps with stirring. Job done. Pour over the melted chocolate and add drizzles of melted white chocolate. Add a few sprinkles and leave to chill in the fridge. One swiss roll is done and ready to consume. It got some serious thumbs up from the family - the boys had slices topped with strawberries for dessert. The filling could of been better - overall I am happy with my attempt at this and would like to try it again, being a bit more adventurous. 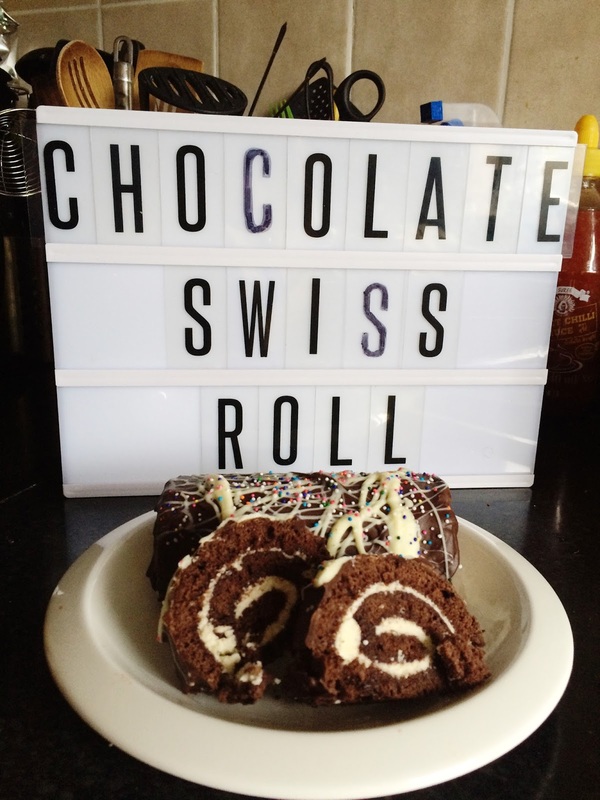 mmmmmm this reminds me of visits to my grandparents when I was a child, my nanny would always buy a M & S chocolate swiss roll for my brother and i. Yours looks delicious i have to say - perfect roll too! Looks lovely. I need to have a go at making a swiss roll, not sure I have ever made one. Wow, what a great swirl you got there. 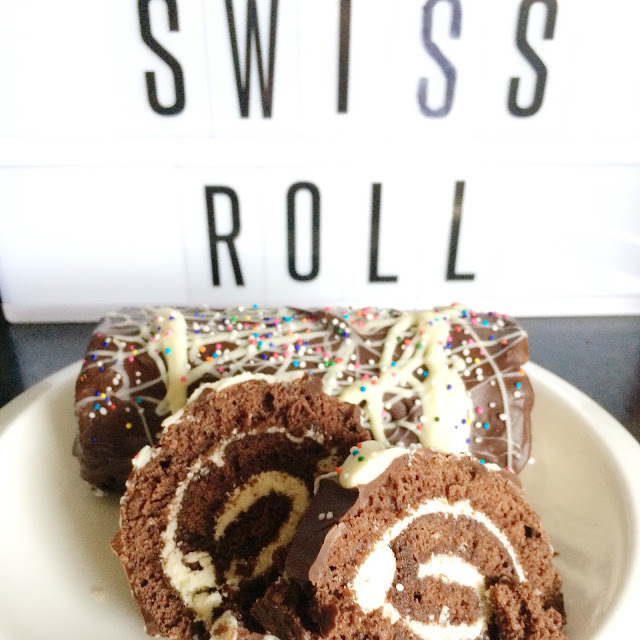 Love swiss rolls and yours looks brilliant!